In this case I have a site column named Color, and I added the alias Color to the existing managed property RefinableString00 and mapped it to the Color column. That works fine and it will refine the search to documents that contain the search term and also match the color property equal to "Green". But is there anyway to refine a search based on values in a lookup column, if that lookup column allows multiple values? In My experience, instead of mapping with RefinableString00, Please create a new Managed Property with the correct properties like Searchable, refinable ,queryable and Multi Valued , then Map it to the crawled property. So by that way you can get Multi Valued refiner. CA--> Search Service Application--> Search Schema--> Managed Properties--> Create New Managed Properties and have the required properties . 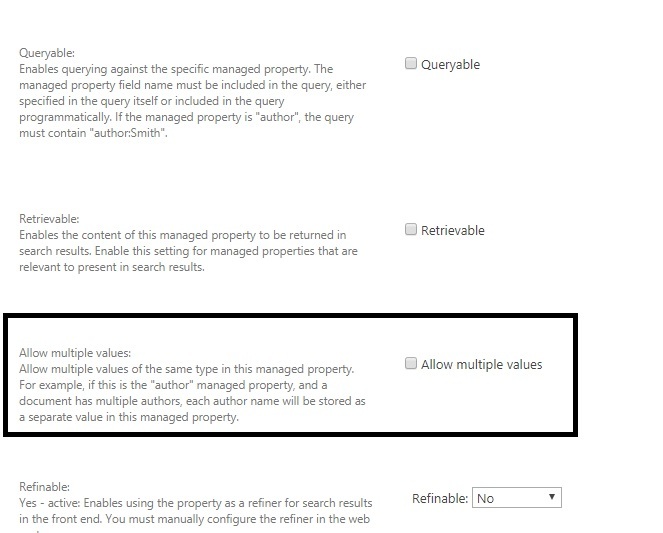 Then use this Managed properties in your REST API refinement filter that would work. We have done similar thing. Not the answer you're looking for? Browse other questions tagged search lookup-column sharepoint-rest-api refiner or ask your own question.